Rope and Sling delivered rigging equipment to Ainscough Crane Hire at the M20 site ahead of schedule. 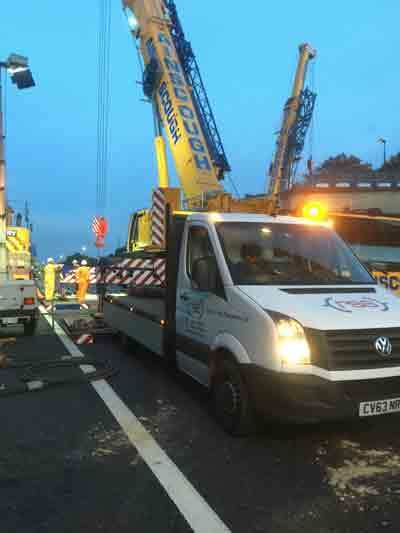 Two 300t mobile cranes from rental company Ainscough Crane Hire conducted a tandem lift during an emergency operation to remove the fallen section of the bridge (another section remained in situ and has subsequently been taken away). It sourced rigging equipment, including a 100t capacity spreader beam in addition to shackles and a variety of slings rigged to take 80t of load, from RSS. Highways England responded to the incident—the concrete bridge fell onto two lorries on the London-bound carriageway at around midday on Saturday 27 August—by announcing that the stretch of the M20 between junctions two and four would remain closed until at least noon the following day, with crews working through the night to clean up the scene. RSS, which has five locations strategically positioned throughout the country, oversaw provision of the rigging equipment from its Aylesbury, Kent facility. Tim Panter, southern regional manager and Graham Dawson, Aylesbury depot manager assembled and delivered the rigging equipment before standing by should their expertise be required during the single lift. Ainscough was pressurised to secure the swift and safe removal of the fallen footbridge section, as Highways England were keen to reopen the M20, the main route to and from the Channel Tunnel and Port of Dover, as quickly as possible. Successful completion was reliant upon the timely supply of quality rigging gear and below-the-hook expertise. Upon completion of the lift the rigging equipment was returned to RSS in Aylesbury where thorough examination took place in line with Lifting Operations and Lifting Equipment Regulations 1998 (LOLER).